Some people have inquired about the various steeds that call the Dining Room Bike Shop home. You can check out most of mine on the “My Bikes” page. Over the next few weeks (or however long that actually translates in terms of time I have to blog) I’ll be featuring the bikes Felkerino rides. These reviews will not be uber technical so if spec description overload is what you seek, best go check out some other blog. Rather, they will be descriptions through my eyes, my eyes being those focused on the practical and other aspects that catch my attention. First up is Felkerino’s aluminum, made in the USA, Cannondale T700 tourer. This bike, of 1992 vintage, is one of the first road bikes Felkerino ever owned as a grownup, and serves as his primary commuter. 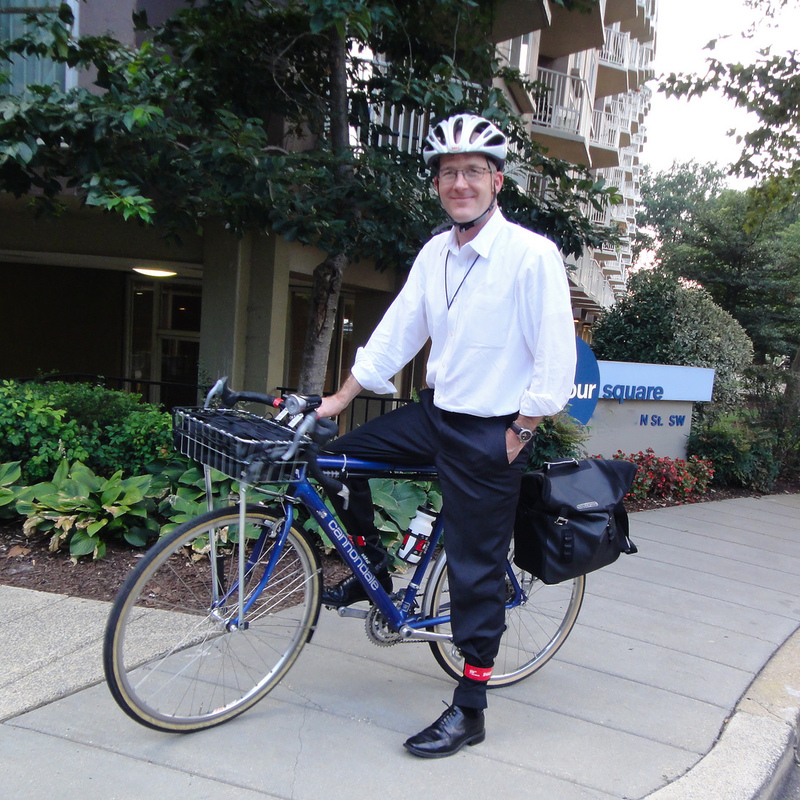 Shimano A530 pedals allow Felkerino to ride in his business shoes to any meeting. A sturdy Tubus Cargo rear rack easily accepts the load of commute necessities contained in his Ortlieb Downtown Pannier, and his extra-long Kryptonite U-lock rests tightly on top of the rack, thanks to a strategically placed bungee cord. 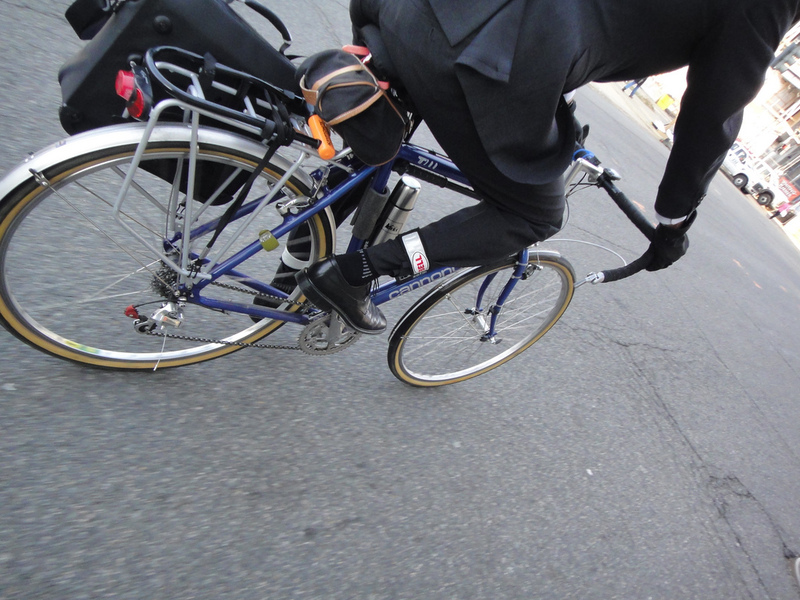 A front Wald wire basket provides the perfect space for him to stash his suit jacket so he does not sweat up riding around town on warm days. Felkerino’s not worried about the anything popping out of the basket at the first pothole he encounters. He bought some netting from BicycleSPACE to prevent any untimely suit jacket escapes. The ever-important bike tools are stashed snugly in a Velo Orange Croissant bag, which fits just under the saddle. Felkerino doesn’t ride this bike around much in the dark, but just in case, he’s set the bike up with a rear Spanninga taillight (oo la la, I love those lights) and an easy-on easy-off battery-operated LED front light from CatEye. That light doesn’t cast a big bright throw, but it does just fine in the street-lit city. He is able to see the road immediately in front of him, and his front light makes him visible to others. SKS fenders protect him from the puddles. Yeah, they don’t match (one is black, one is chrome), but they both work equally well at keeping him dry. The bike is currently set up with drop bars, but there’s been discussion among the Dining Room Bike Shop staff about switching those out for bars that sweep back to allow a more upright ride. That might do a better job of keeping the shirt from wrinkling and reducing any pull on shirts’ shoulder seams. This is a perfect commuter bike. Not too priceless or dear to be ripped off, dinged up, or locked to a post, but carefully set up to comfortably manage the daily commute. Hope you enjoyed this summary about Felkerino’s Cannondale T700 Tourer and the introduction to the first of a few of the bikes I’ll feature from the other half of the Dining Room Bike Shop. 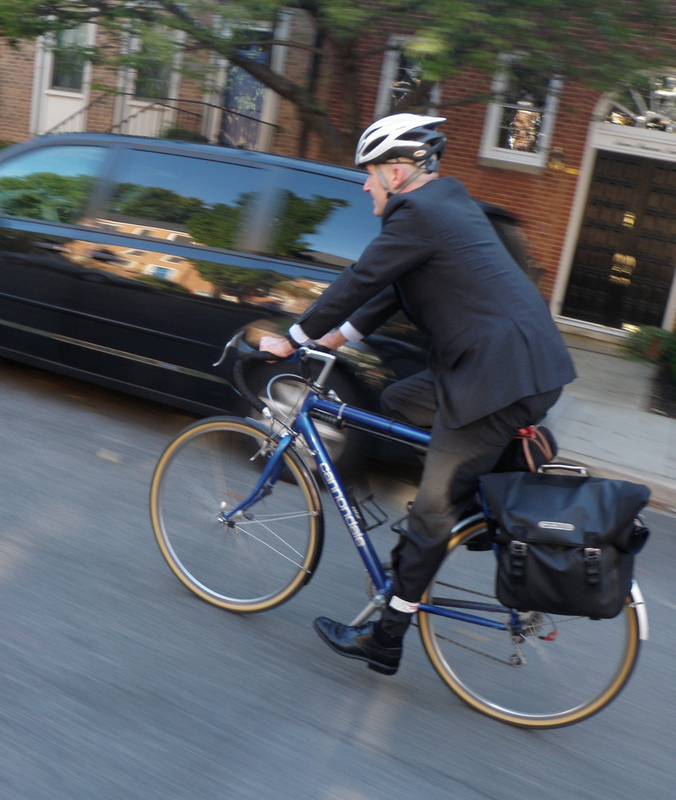 I like the bike… and I don’t think I’ve ever seen Felkerino in a suit, so I like his style too! AND I must belatedly ‘like’ your blog renovation – looks great! The Cannondale’s old “T” series bikes are all cool bikes. Nice set up for commuting. Hooray! I’ve always been curious about Felkerino’s many bikes. Looking forward to this series as well. Glad to see your bikes on your site, too! I like it. I’ve never been aesthetically inclined to the basket, but you make a good case for its utility. and being on the hunt for dual-sided pedals, I’ll be considering the A530’s you mention. Wonder if you can treat us to a shot of the dining room bike shop? Like an art exhibit… no photos permitted. Maybe a special tour will be offered some day. Yaayy, a T700. That’s what I’ll be riding from CT to DC in 4 weeks and has been my primary bike for nearly 20 years. Glad to see other examples are still on the road. Cool! If you are in DC on any Friday morning… we have a cycling group that meets at Swings for coffee. It’s right by the White House. Lovely! I like the fork on that bike.